According to the latest Land Registry figures Acton property sales average £374,552 one of the highest monthly averages on record. Three properties in the area went for over £1 million during the month - on Pierrepoint Road, East Churchfield Road and Twyford Avenue. 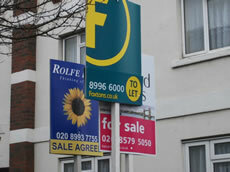 London property prices were up by 6.2% in December compared to last year and 1% up on November 2010. This brings the average property price to £342,325 in comparison to the figure for England and Wales, which is £163,814. Nationally prices fell marginally in December compared with the previous month and are now only 1.5% up on the year with many areas of the North experiencing price falls. Nationwide's House Price index for December which is based on offer prices rather than actual sales like the Land Registry did show an increase. Martin Gahbauer, Nationwide's Chief Economist, said, "When house prices are trending down only modestly rather than decisively – as has been the case in recent months – it is not unusual to a see a mixed pattern of monthly declines and occasional increases." He added, "London and the South East saw particularly large price gains during this period (2010), as the scarcity of property was most acute in these regions. London will also have benefited from the strong recovery in the financial sector, which is an important driver of buyer confidence and housing demand in the capital."